I'd like to say I just haven't had any time in the shop this week, but the truth is I hit a wall. 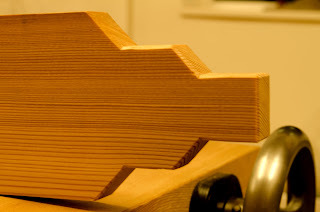 Earlier this week I milled the stock for my leg vise, deadman and parallel glide. All was going extremely well. I had routed the groove that the deadman needs in the bottom of the top of the bench. As you can see, I even had a knot explode on me. 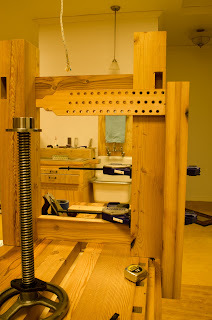 and then proceeded to layout and drill the holes that are used to keep the leg vise from racking. CATASTROPHE!!! I had horrible tear out. Luckily, I have many friends on Twitter and other social media sites and I ran the situation by them. Some felt I should just be OK with it and move forward. "It's just a bench!". My buddy Chris Wong of Flair Woodworks and Time Warp Tools thought I could simply do another, thicker glide and plane off the offending tear out. My Hand Tool School teacher, Shannon Rogers, explained the forces that the glide encounters doing it's job and suggested that maybe Fir was a bit too soft to handle the situation. My first reaction was to follow Chris' suggestion to go thicker and stay with the Fir. A little background might help here. I'm a bit obsessive compulsive in certain things of my life. I really wanted to build the entire bench out of Fir. If I was to introduce a contrasting wood, I would have done the end cap of the wagon vise in that wood. I envisioned me sawing apart the end cap from the bench, which is now glued in place, simply to appease a compulsion that would gnaw at me endlessly until I succumbed to the somewhat psychotic demand. Ultimately, I am choosing to move forward with the glide being made from some Osage Orange I have on hand, which over time will fade, but is fairly close in color to the old growth Fir I've used on the rest of the bench. While I had the part dimensioned and the mortise fit, I laid out the cuts I need to make on the leg. I will wait to do those until I have the new part, just in case the dimensions change a bit. Only time will tell if I have to start tearing things apart to make them either match or properly contrast. YES, I'm weird, but I'm OK with that. That's not builder's block Vic, its a quality issue that bugs the heck out of you. Nothing wrong with that, seems to me you are setting quality parameters. 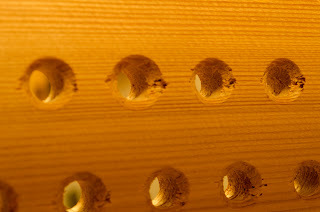 I agree with Shannon about the fir, on my 4" thick fir benchtop, the holdfast holes are getting oblong from the compression. Fir is really stiff, good in tension, but not good with compression, which that parallel guide will see in large measure. I also agree with Chris, if you really can't stand a little tear out (it IS a workbench afterall) drill thick, then plane away the tearout. In the end I think you made a good choice for this component with Osage. I already can't see much color difference, and it'll only darken with time. Though I would also not have found it objectionable to do JUST the guide and some other bits and pieces in a contrasting wood, without starting over on the endcap. Nice work. You'll be working on it in no time! I think I might have been watching your live stream when you were getting the tear out. I saw you shut off the drill press, look like you cursed, and turn it back on again. Yea, I'm pretty sure some explicatives escaped my lips. Actually Chris, I believe that's what I'm going to do. Cut the Osage to fit then veneer the sides with Fir. Nice solution to the problem, Vic. Osage Orange is a beautiful wood. It may darken a bit more than you like over time, but hopefully not so much that you have to tear your bench apart. Perhaps you Fir is just too old? St. Roy did an episode about Hickory and mentioned that the second growth stuff is actually stronger than the ancient stuff. 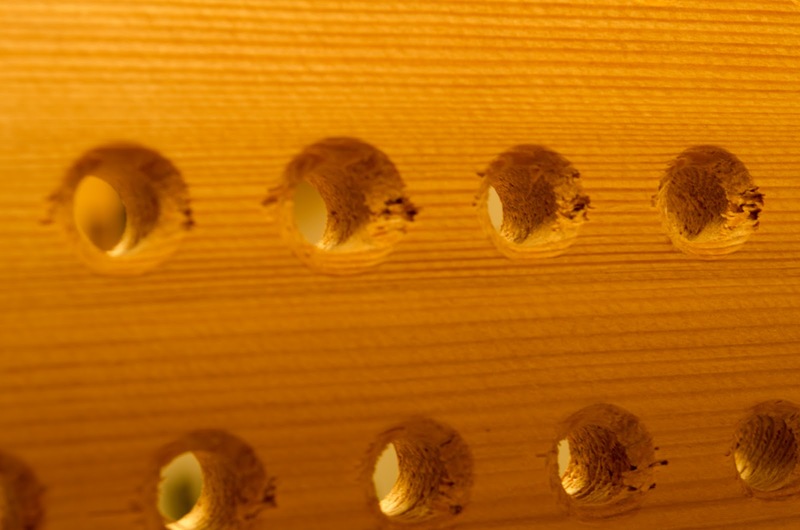 Interesting to see the tear out all the way down the sidewall of the holes. 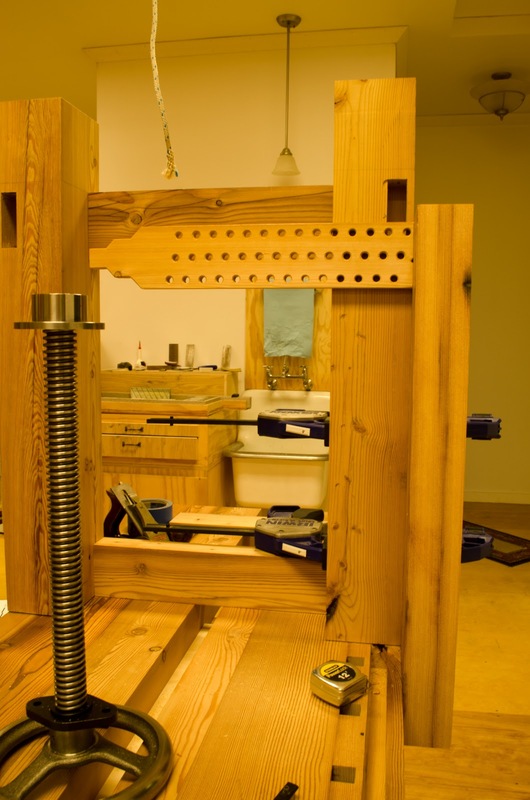 Did you have the drill press spinning the right direction :)? Neil - I'm glad I'm not the only one. I certainly hope I always push past my comfort zone. Nick, I couldn't have a better OCD competitor than Rob Bois. I've decided on the Orange Osage. The small wheel brackets require a denser wood, too. Also, that is the Fir glide you see in that photo. The newly milled Orange Osage is quite yellow. Kari - Yes, the Orange Osage is a nice warm orange after a year, or so, in the shop. It will go there again, I'm sure. David J - I don't think that is the case with this Fir. It's extremely stable at this point. I'm finding it a joy to work with, which isn't my experience with new Fir. New Fir is very soft and compresses too easily, rather that holding a crisp edge. The tear out that seems to go into the hole was on the outside. I think it's just the angle of the photo. David J: weirdly hardwoods and softwoods are backwards when it comes to strength and growth rate. 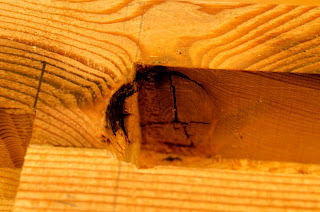 Fast grown oak is very strong, while slow grown oak is more brittle. However, fast grown fir is not nearly as strong as slow grown fir. Check out the book Understanding Wood for details.